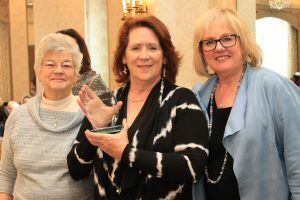 Marlton, N.J. – Samaritan Healthcare & Hospice presented its annual Judy Taylor Award for Home Health Service Excellence to Debbie Grissler of Egg Harbor Township and David Adebiyi of Lindenwold at its 2019 Winterfest celebration – an annual event recognizing employees and volunteers for their service milestones and dedication to the not-for-profit organization. Each year, the Judy Taylor Award for Home Health Service Excellence award is presented to a certified home health aide (CHHA) who has exceeded expectations and showed outstanding performance in his or her job. As this year’s recipients, both Debbie Grissler, a CHHA with Samaritan Healthcare & Hospice since 2008 and David Adebiyi, a CHHA with Samaritan Healthcare & Hospice since 2013 are being honored for the incredible personal, hands-on care they provide to patients and their families. Judy Taylor, the award’s namesake, retired from Samaritan in 2011 after working in the CHHA department for 25 years. She served as inspiration and role model for the more than 80 aides she supervised and coordinated all functions of a department that is an essential part of the hospice team. Hospice CHHAs provide personal services such as bathing, dressing, and grooming. They also support patients and families by providing light housekeeping and laundry services, serving small meals and snacks, and supporting family caregivers by teaching appropriate ways to lift, turn, and re-position their loved one, to keep them as comfortable as possible. Debbie Grissler of Egg Harbor Township (center) pictured with Judy Taylor (left) and Eva Russell, director of clinical support at Samaritan Healthcare & Hospice. 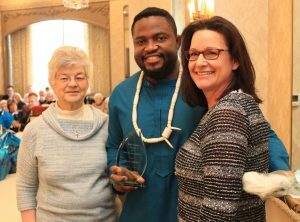 David Adebiyi of Lindenwold (center) pictured with Judy Taylor (left) and Donna M. Fahey, MFA, MSN, RN, CNL, HNB-BC, manager of The Samaritan Center at Voorhees. Samaritan Healthcare & Hospice is a not-for-profit, non-sectarian, independent organization locally founded in Moorestown, New Jersey in 1980. Samaritan is the regional leader for hospice care, palliative (comfort) medicine, grief support and counseling, end-of-life education, and advocacy. Samaritan serves people in Atlantic, Burlington, Camden, Gloucester, and Mercer counties who are coping with the stresses of aging, serious illness or grief in their homes, assisted-living, or nursing home communities and through two inpatient hospice centers: The Samaritan Center at Mt. Holly and The Samaritan Center at Voorhees. Two thrift shops, in Westmont and Pitman, support Samaritan services and programs. Samaritan is accredited by The Joint Commission; a member of the National Hospice and Palliative Care Organization (NHPCO); the Home Care & Hospice Association of New Jersey; and is a four-star-level hospice in NHPCO’s We Honor Veterans program, created in collaboration with the Department of Veterans Affairs (VA). For more information, visit www.SamaritanNJ.org.